with this advanced listening technology tool, you can improve how your clients process sound and movement. enlisten® software is the revolutionary copyrighted technology through which sound listening corporation delivers highly customizable sound stimulation listening training. designed to allow professionals in a variety of fields to easily and effectively integrate listening training into their practices, enlisten® stands alone in terms of flexibility and versatility. enlisten® is delivered on equipment readily available worldwide -- computers and ipod/mp3 players. enlisten® can work anywhere your computer can go. enlisten® can be delivered with regular headsets or with bone and air conduction headsets, which tend to increase the beneficial results but are not always necessary to achieve goals. enlisten® training includes 7 days of formal course work plus some personal listening and internship experiences to reduce time spent away from work. enlisten® provides more sound segment setting choices for filters, tone channels, bone and air conduction delays, and gating types than other listening technologies. enlisten® includes a set of pre-written listening programs for general applications. enlisten® software is used with an assessment and program decision model, so that listening programs for a variety of applications, aptitudes, and competencies can be adapted from sample programs and created using listening program editor to meet the needs of a specific individual or group. enlisten® programs may be written for automated delivery in the home, school, workplace, or center, leaving the professional in control without constant intervention to change settings or select content cds. sound listening corporation provides professional training to expand the availability of enlisten® programs world wide. if you have any questions about professional training, including training location inquiries and requests for group training, contact dr. billie thompson directly at billie.thompson@soundlistening.com or 602-381-0086.
enlisten® software comes with thirty hours of music and voice, licensed primarily from apm music, and enhanced through sound engineering. additional music and voice can be purchased as it becomes available for general and specialty programs, including active voice work with a studio quality microphone connected to the computer. enlisten® licensed sounds are encrypted and can only be played with enlisten® software. for best results with many applications, it is recommended, though not required, that enlisten® be used with earphones that have bone conduction and air conduction connected to the us patented thompson pc to earphone adapter for laterality control. enlisten® operates on windows xp. each enlisten® license can be registered to and installed once on one computer, unless a multi-license is purchased and used with a special sound card to provide the proper output of sound. a set of pre-written listening programs for general applications is given to professionals when they complete level 1.
a separate listening program editor is given to those who have completed level 2 training so they can adapt and create individualized client programs. discounts are available with the purchase of six or more enlisten® licenses per site/ professional. the many parameters controlled by the licensed level 3 enlisten® professional give complete freedom to write and store individualized programs using encrypted licensed music and voice or to use or adapt pre written enlisten® programs to meet the needs of individuals or groups with similar presenting problems or goals. 12 high pass, 6 low pass, and 15 band pass filters make one piece of music have up to 33 different sounds by filters alone! 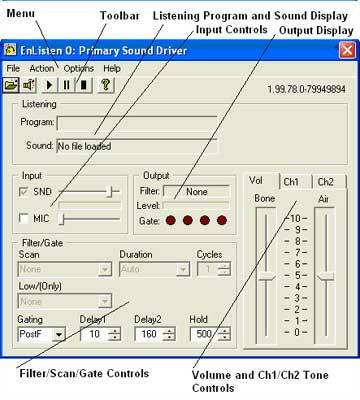 add selection of 3 gating types (+ an option for no gating), 3 types of delays, and 2 tone channel settings, and you know you have nearly unlimited ways to train the ear to discriminate, attend, organize, and integrate acoustic signals so that the brain receives information with the least distortion and confusion of information. oh yes, and there's the choice of which sound file to select from 30 hours of encrypted music and voice, or your own selection from other sources. enlisten® provides great quality and control for a reasonable cost and low renewal costs for the serious professional as well as one who is beginning to investigate the use of listening technologies to improve abilities and increase human potential.